168 pages, 11" x 12" Hardcover. Publication September 2013. As America huffed its way to the end of the '70s, a change more profound than any one cultural trope's evolutionary death knell was taking place. Perceptively distilled in a new volume of photographs by longtime National Geographic shooter Nathan Benn,Kodachrome Memory: American Pictures 1972–1990 depicts an America of boisterous legend and vibrant regionalism, teetering on the cusp of the coming Information Age's great cultural flattening. Nathan Benn embraced color photography before it was considered an acceptable medium for serious documentary expression, traveling globally for National Geographicmagazine for two decades. In revisiting his archive of almost half a million images, and editing his photographs with a 21st-century perspective, he discovered hundreds of unpublished American pictures that appeared inconsequential to editors of the 1970s and 1980s, but now resonate—in beautiful Kodachrome color—with empathic perspectives on everyday life in forgotten neighborhoods. "Kodachrome Memory celebrates the significance of American regional diversity as it was 30 or 40 years ago, before the advent of Internet culture and before the country became one vast strip mall stretching from sea to sea. The seemingly inconsequential subjects of Benn's photographs—which are keenly observed and evocative of a time and place—act as metaphors for American culture and values. 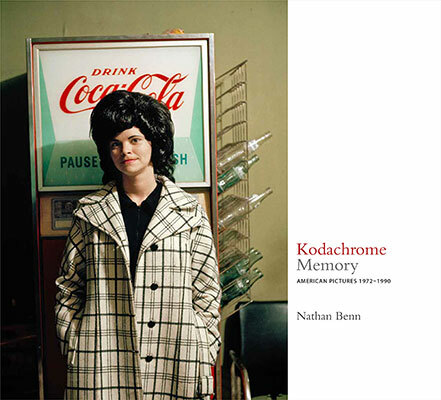 Although much of Benn's work was done for a magazine and not gallery walls, his use of color throughout holds its own with artists of the period such as William Eggleston and Stephen Shore." Nathan Benn was born in Miami, Florida, in 1950 and graduated from the University of Miami with degrees in psychology and mass communications. Immediately thereafter he became a photographer for National Geographic magazine, where he remained for 20 years. He was the Director of Magnum Photos, Inc., the prestigious agency of documentary photographers from 2000–2002. He is a Trustee Emeritus at the George Eastman House Museum and lives with his wife, a fine arts photographer, and son in Brooklyn. Paul M. Farber is a scholar of visual and popular culture. He has a PhD in American Culture from the University of Michigan, Ann Arbor. Farber is one of the authors of This Is the Day: The March On Washington (Getty Publications, 2013), and his work has previously appeared in Vibe and Criticism, and on NPR. He currently teaches in the Urban Studies program at the University of Pennsylvania.